The first thing that is required in this recipe is the combination of cheeses: requeson, goat cheese and parmesan. The requeson is mild and delicate, the goat cheese is a little stronger and creamy and the parmesan is powerful and dry but it provides a fruity touch that combines in a delicious way with the other cheeses. On the herbs’ side is the chives, tarragon and parsley. The combination of these herbs gives freshness, sweetness and an aniseed touch to the dip – they also aromatize it and fill it with textures. As you can see the result is a sensational dip, that can be used to eat with your favorite snacks . It could also be used to put to a tasty baked potato. To make the dip first you are going to work a bit with some ingredients and then everything is mixed. In this recipe only easy work has to be performed. The chives are used in this dip and if you don’t have them, you can substitute them for spring onion stalks. 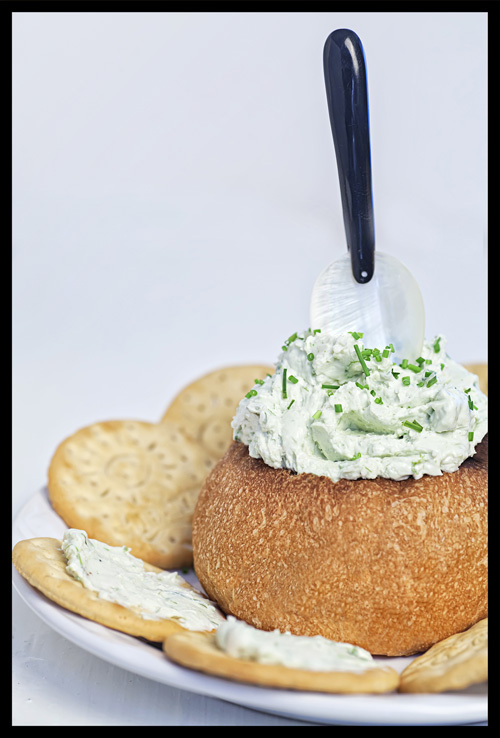 The dip is prepared with fresh tarragon although it can also be used dried, just adjust the quantity to 1/2 tablespoon. In 10 minutes you will have a delicious dip on your table. This recipe is for 6 portions. Grate the skin of 1 lime, reserve the zest and discard the lime; then set aside. Don´t grate the lime too deep until reaching the white skin because it bitters. Finely chop 2 chives sprigs, 2 tarragon sprigs and 2 parsley sprigs; then set aside. 3.5 oz of Goat Cheese. 1 oz of grated Parmesan Cheese. Mix very well the bowl ingredients with a balloon whisk or with a mixing spatula, until having an homogeneous mixture. The Lime Skin that was grated. The Chives that were minced. The Tarragon that was minced. Mix very well the 3 cheese and herbs dip with a balloon whisk or with a mixing spatula. Suggestion: This can be a very tasty filling of some delicious quesadillas. Did you like the 3 Cheese Dip? If you have problems in getting the tarragon... your problems are over, you can buy it here. Prepare the dip with an authentic parmesan cheese from Italy. You can’t imagine the flavor that it will give to the dip. Buy this goat cheese set and use in the dip the one that you like the most.